Car seats are one of the most important purchases parents make. That’s why GB places their priority on safety with the GB Asana35 AP Car Seat. Their unique 3-way FirmFit System provides Mom and Dad the ultimate peace of mind. 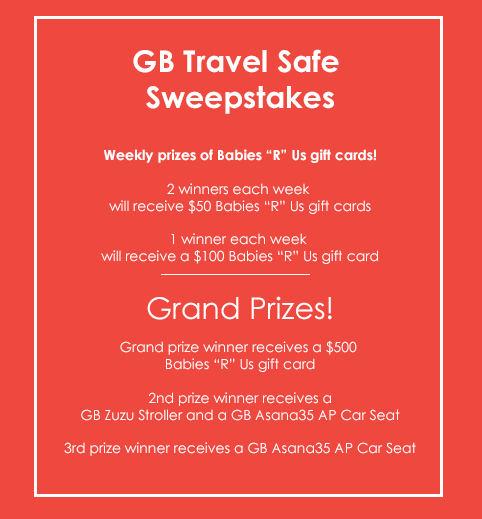 As part of GB’s effort to promote car seat safety and their recently launched Asana35 AP car seat, they are hosting the GB Travel Safe Sweepstakes offering parents a chance to win a $500 Babies “R” Us gift card with second and third place winners to receive GB baby gear like the GB Asana35 AP and the compatible GB Zuzu stroller! Leading up to this grand prize, weekly winners will receive Babies “R” Us gift cards. PLUS you can get extra points for adding the Asana35 AP to your registry! Entry is simple, just complete the widget form below. - Each week, two Sweepstakes participants will be randomly selected to win a $50 Babies “R” Us Gift Card. - Each week, one Sweepstakes participant will be randomly selected to win a $100 Babies “R” Us Gift Card. - If you have a Babies “R” Us registry, you can gain extra points by adding the GB Asana35 AP and providing us with your registry number! - Performing these entry tasks will also enter participants to win weekly $50 or $100 Babies “R” Us gift cards through the GB Travel Safe Sweepstakes. Make sure to follow GB on Pinterest, Facebook, Twitter, and/or YouTube for more info on car seat safety and other great giveaways. What do you think of GB? What do you think of this sweepstakes? What are you most excited to win?